Royal Mail have recently used neuroscience to measure mail’s effectiveness vs digital channels, and we think the results are fascinating. As a mailing house ourselves, we’re naturally strong advocates of mail marketing but this research further proves how effective this offline marketing channel really is. It highlights the pivotal role that mail can play to deliver real cut through in a complex multi-media environment. We thought we’d take the opportunity to share some insights and results from their ‘Why mail cuts through’ research. Royal Mail wanted to understand how consumers process brand messages at a subconscious level. Experts were able to use neuroscience to study the impact different media has on how brand messages are remembered. 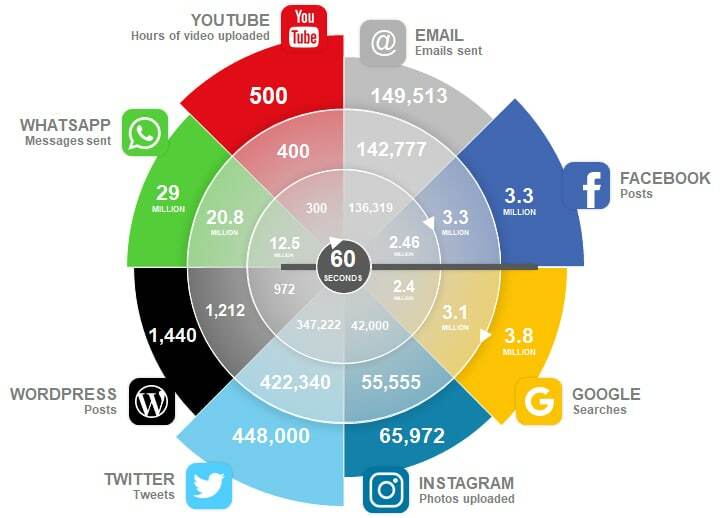 The research highlights how it’s never been easier to target an audience in real time, thanks to the rise of digital. On the flip side, it’s never been harder to make a message cut through. People are exposed to thousands of brand messages a day so a single message can so easily get lost in the noise. This means that choosing the right channels to connect with people effectively has never been more important. Brand messages must work a lot harder to stand out and be remembered. And with GDPR to consider, all communication should aim to make consumers feel valued and respected. For this reason, Royal Mail asked the question, how can you cut through the noise to engage an audience with a message that’s memorable and inspires action? To see if mail could be the answer, they commissioned neuroscience marketing experts at Neuro-Insight to measure the subconscious effect of different media channels on consumers. Royal mail wanted to understand how memorable a brand message could be, and how different media can influence its memorability. A message that’s remembered is more likely to inspire action. “Long-term memory encoding, the key metric in our neuroscience study, measures the strength of what’s stored into memory as people experience a stimulus. ‘Long-term’ refers to anything that’s stored for more than a few minutes. This is important for marketers, as it has been shown to influence decision making and purchase intent. Memory encoding is both an enabler and a predictor of likely future action. Not only did the research reveal how memorable mail is, it also demonstrated that mail is 33% more engaging than email and 35% more engaging than social media advertising. The Royal mail study goes on to make an interesting point that mail is the touchpoint that people can actually touch! The power of touch can make a real difference to how memorable something is. Mail reaches people directly in their homes and gains their full attention. Mail has a more powerful impact on long-term memory encoding – 35% stronger than social media and 49% stronger than email. 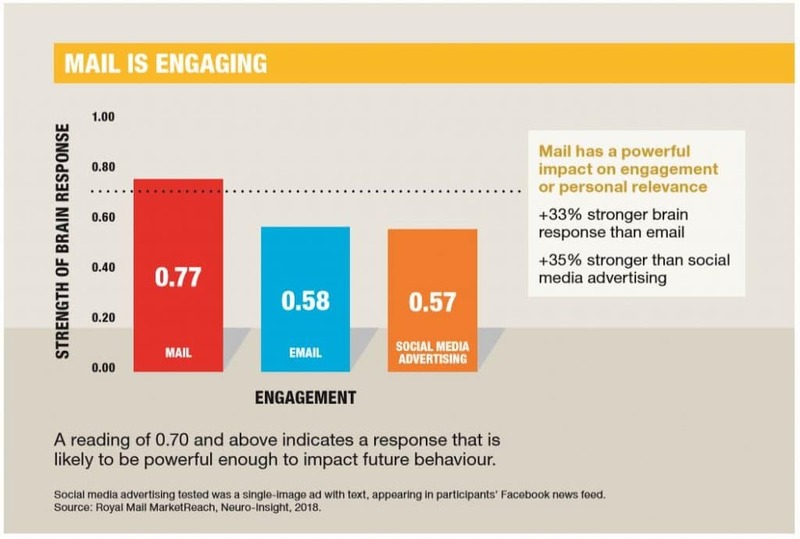 Consumers who saw mail first had 30% more dwell time on social media ads. 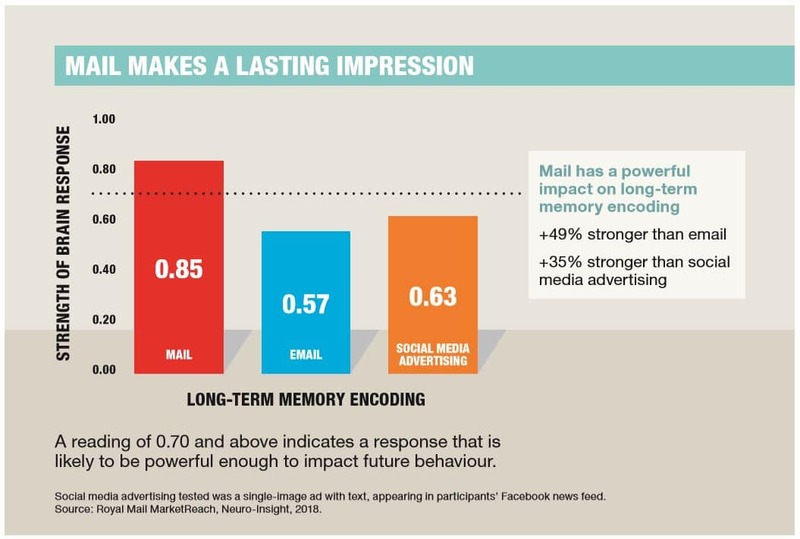 Memory encoding to social media advertising was 44% higher when people had seen mail first. 94% of mail is engaged with in some way (JICMAIL). Long-term memory encoding is strongly linked to decision-making and purchase intent. 31% of addressed advertising mail results in a commercial action (JICMAIL) . Mail’s physical attributes are clearly disruptive as part of a customer contact strategy. If you enjoyed this article, you might want to check out our 3 reasons why you shouldn’t ignore mail marketing article. We’re a professional mailing house and print services provider based in Leeds West Yorkshire. We have the know-how, equipment and resources to deliver on any direct mail campaign and do just that for a number of clients, big and small. But it’s not just direct mail we can help you with. We offer fully integrated print and mailing solutions so we can handle every aspect for you. 1 Ofcom, Adults’ Media Use and Attitudes Report, 2018. 2 Data from JICMAIL (The Joint Industry Committee for Mail, which delivers industry-standard audience measurement data for mail), shows that 31% of all addressed advertising mail leads to a commercial action such as visiting a sender’s website or making a purchase. 3 JICMAIL, Kantar TNS, Q2 2017 – Q1 2018.